Do you ever get the feeling that your staff aren’t entirely happy with their job? Perhaps you’ve noticed the glum look on their faces or have heard a constant stream of sighs throughout the office. Well, you’re not alone. According to the JobsCentral Work Happiness Survey Report 2017, the Singapore workforce have little to cheer about when it’s time to go to work. Among 1,843 respondents, aged 16 years and above, a high 65% of the respondents indicated that they are not satisfied with their current job. The respondents recorded an average Overall Work Happiness Indicator Score of 46.8 out of 100, marking a record low since the survey begun in 2009. This year’s survey found that workers in translation and editorial were the happiest in Singapore with an average Work Happiness Indicator score of 75.8. This is followed by staff in public relations (60.1), marketing (60.0), research and development (59.2), and legal (59.1), rounding up the top five happiest workers in Singapore. Human resources professionals came in eighth with an average Work Happiness Indicator score of 55.2. On the flip side, those who felt most unhappy at work are from administrative (49.6), management (49.5), merchandising / purchasing (49.2), operations (48.3), and customer support (47.0). Segmenting respondents by age group, the survey revealed that those at the start of their careers were the happiest. Employees aged 16-20 years appeared to be the happiest with an average happiness indicator score of 59.4. 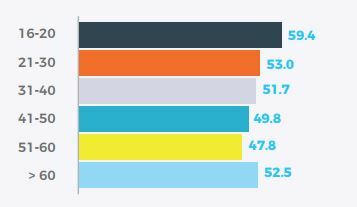 The score dips below 50 for employees aged 41 – 60, with employees between the ages 51 – 60 being the most unhappy. 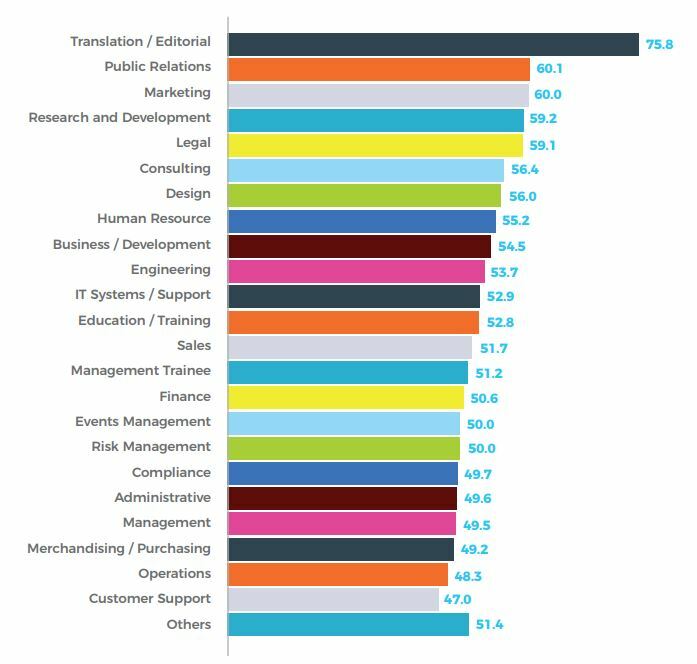 Perhaps unsurprisingly, respondents placed the most importance towards their salary, rating it with an average importance weight of 9.11. Work-life balance (8.12) came in second while good relations with colleagues (7.32), interesting work (7.04) and acceptable work demands (6.86) made the top 5. This suggests that direct monetary and tangible rewards may be the key to a happier workforce. Substantiating that, a majority of employees (34.6%) indicated their desire for a pay raise from their employers. Yet, high wages doesn’t necessarily make employees happy. Employees commanding a monthly salary range between S$9,500 to S$9,999 were found to be the happiest with an average score of 57.3. However, the score dipped to 56.7 for those earning S$10,000 and above. To combat the notion of being underpaid, he suggested that employers should gather feedback from their staff and together develop an ideal compensation package to boost overall happiness at work. After overtaking Hong Kong for the first time in 2017, it is now slightly behind, with a difference of 0.1% between the both count.. Eight construction worker fatalities this year have prompted the Ministry of Manpower to review the Demerit Points System and the ..
Filipinos have some of the best experiences of work-life balance in Southeast Asia, according to a new study by recruitment portal..
Increasingly diverse gender and childcare benefits create a great environment for women, but there's still room for improvement. ..